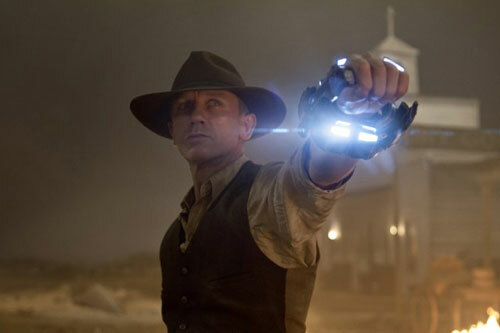 Last week I got to attend a press conference for Cowboys & Aliens, with Daniel Craig, Harrison Ford, Olivia Wilde, Jon Favreau and Roberto Orci all in attendance. So much of what was said during the press conference was interesting (well, it was at least interesting to me) and I’ve been trying to figure out how to blog about it all; should I just do one massive post, or one post with only the cool bits? Instead I’ve split it up into four parts: this first one features all the questions for Daniel Craig and his answers. I’ll try to post the rest later this afternoon. Enjoy! Q: I wonder if I could regress you to the summer of 1977 and ask what your 9 year old self might have thought of sharing the screen with Mr Ford? DC: The truth of it is I don’t really know when Bladerunner came out, but I went to the cinema and sat in the cinema on my own, because not many people went to the cinema where I went to. I had no idea what was playing and Bladerunner came on. I thought then I want to work with that man. And I did. Q: When a stranger arrives in a western town, you immediately think of Clint Eastwood. Do you go with that or do you try and fight it? DC: No, god, you go with it. I mean, no, I wouldn’t try and fight that. I don’t really know what the question is, but if you’re asking me whether or not I watched Clint Eastwood for this movie, yes of course I did. But I watched everything else as well. You know, I watched a lot of John Wayne, Butch and Sundance, I’m just reeling off westerns now, it’s easier than answering the question. But yes, I kind of stole everything I could, but nothing specific. Q: Have you got a favourite cowboy film of all time and/or a favourite alien film of all time? DC: Little Big Men, I think, is most probably my favourite western. And Alien. Q: This is quite a physically demanding role, Daniel, was it more so than the role of Bond? Did you pick up more bruises and grazes from playing this than you did from playing 007? DC: It was just different. I mean, I don’t get to ride many horses in Bond, so that was really kind of the main distinction. No more than usual. There’s a lot more that I couldn’t do in this, because horse riding, although I’m getting better at it, I’m no expert. So a lot of what you see’s my brilliant double and brilliant stunt men. Funny enough, I picked up more bruises at the studio when we got back to LA than I did out when we were filming. I think everything’s sort of made out of fibreglass and that seems to scrape and bruise you worse than the real thing. Q: How much of the classic Steve McQueen technique of going through the script and ripping out your lines did you do? Just so that you could say something with a look rather than with a line of dialogue? DC: It’s kind of a natural process how it ended up being like that. As far as I’m concerned, the less I have to say the better. The more the character sort of talked about how he felt about things, the less real it seemed. He’s a man of action opposed to a man of words. Isn’t there a Clint Eastwood legend that he only has 11 lines per movie? The character just wasn’t more verbose; it was literally saying “I don’t think he’s going to talk about his feelings before he goes in and starts shooting”. He’s going to start shooting and maybe talk about it afterwards, it’s simple as that. I make a joke out of it, but it was something that happened completely naturally as opposed of it being a conscious decision. It just seemed when gong through the script that sometimes I just went “I don’t need to say that. It’s already been told. That story’s already been told with the actions that I’m doing”.